As you all know, AdGuard has a rich feature set in the sphere of ad blocking and privacy protection. Up until now, we used to write a separate post about every feature we have, but there was no place you could find our features collected all together in a full-fledged overview. By reading this article, you´ll learn a lot of new things about AdGuard for Android. 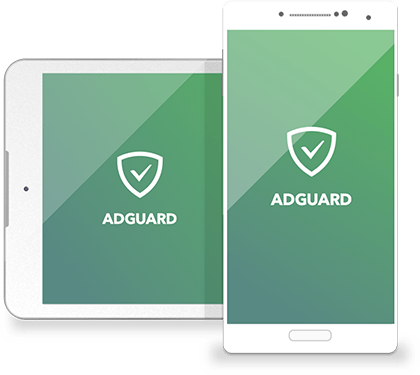 The main function of AdGuard for Android is ad blocking, which includes blocking of annoying banners, pop-ups and push messages. All your traffic goes through a VPN-server installed on your device, that makes filtering faster and more secure. Because of the local VPN, your data is not transmitted to any third-party servers. The process of blocking ads on web pages is described here. Ad blocking feature seems to be as plain as daylight, but it's not that simple. Nowadays you can find a lot of programs which are considered to protect you from annoying publicity on the Internet, but AdGuard makes it way better than other ad blockers. 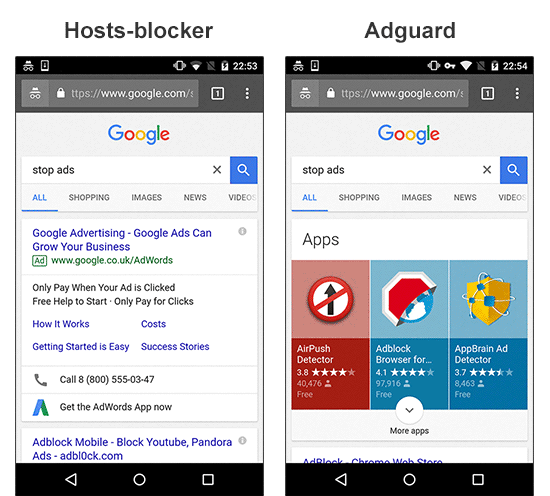 Unlike many other other ad blockers, AdGuard is not just a "hosts" blocker, but a full-fledged "filter" that passes through itself traffic of all apps, and then decides what to do with it. These decisions are based on the set of special rules. For example, in the picture below you can see that AdGuard (right side) is capable of eliminating the ad which is impossible to block without applying cosmetic rules. Thanks to the HTTPS filtering, AdGuard has outstanding ad blocking capabilities. However, you'll need to enable this feature manually. To find out how else AdGuard is different from other ad blockers you can have a look at this detailed comparative analysis. Don't you know that even if you don't use specific apps like Facebook it doesn't stop them from collecting information about you? We did our own research you can read here. Most importantly, we have a tool to protect you from being tracked on the Internet. 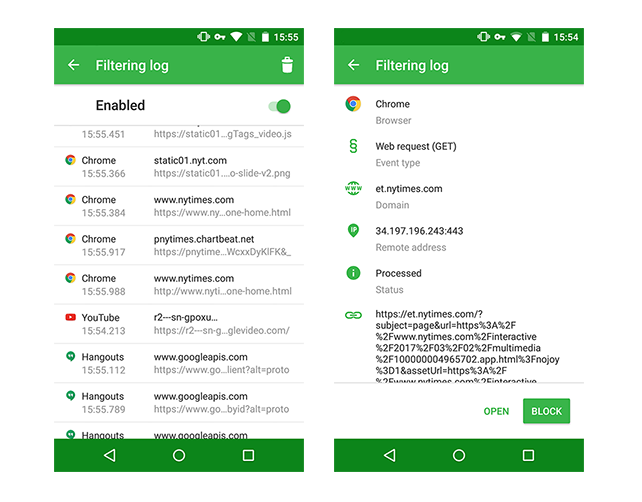 AdGuard for Android includes a pair of potent filters, specifically created for privacy protection: "AdGuard Spyware filter" and "EasyPrivacy". Many websites gather information about their visitors, such as their IP addresses, information about browser and operating system, screen resolution, and even what page the user was redirected from. The Spyware filter protects your personal data from automatic data gathering systems. Turn on this filter, and no one will be able to track your web activity anymore. The Internet is a pretty dangerous place where your device can be attacked by viruses whereas your personal or financial information can be stolen. Fortunately, AdGuard's Browsing Seciruty module protects you from visiting phishing and malicious websites. It also prevents malware from being downloaded onto your device. At the same time, your personal data is not transferred anywhere, and AdGuard does not know which websites you are visiting, because security check is not performed against open web address (URL) but through hash prefixes (hash is a certain data structure that renders unambiguous each address added to the base). You can learn more about AdGuard's phishing and malware protection here. Don't forget that with AdGuard for Android you always you have full control over the device. You can see all information about requests coming through the Internet connection on your device. 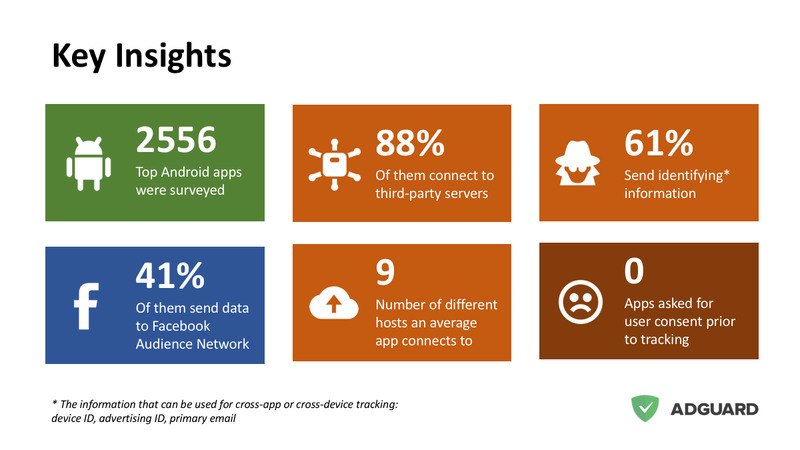 No apps will try to go online without you knowing. In the Apps Management special module, you can choose which apps should have WiFi or mobile data access. You can also change the rules of background Internet connection for your apps when the screen is locked. These settings can be applied to all installed apps or just to selected ones. This feature appeared in AdGuard for Android 2.9 and made your life easier. There you can have a complete control of what is going on on your device. In the Filtering log you can manage the access for requests, e.g. block them. You can also check the requests and see whether they are safe. DNS filtering is one of the most effective ways to protect you from malicious websites, which consists in redirecting a request to the special server. If you have DNS filtering enabled on your device, all DNS requests will pass through AdGuard before reaching the DNS server. So AdGuard can block ads by requests. How exactly? It has a special 'Simplified domain names filter' containing a large amount of ad and tracker domains, which it uses in conjunction with User filter to recognize 'bad' requests. Every request is checked against this filter, and if there's a hit, instead of forwarding it to the DNS server, it is being rerouted to a 'blackhole'. The main advantage of this approach is extremely economical and saving. Once a domain is blocked, it won't be requested again within an hour. The disadvantage being the roughness of this method: specific URLs can't be blocked, only whole domains. It can sometimes lead to 'breaking' of a websites functionality. If you use regular plain DNS protocol, you are at risk of your DNS requests being intercepted and, subsequently, eavesdropped and/or altered. The experiments show that the DNS tracking can even be used to construct a 'profile of interests' for any user. AdGuard is able to use DNSCrypt - a special protocol that encrypts communication with the DNS server, thus preventing tampering and tracking by any third party including your ISP. If you care about your online privacy, we strongly recommend using DNSCrypt. 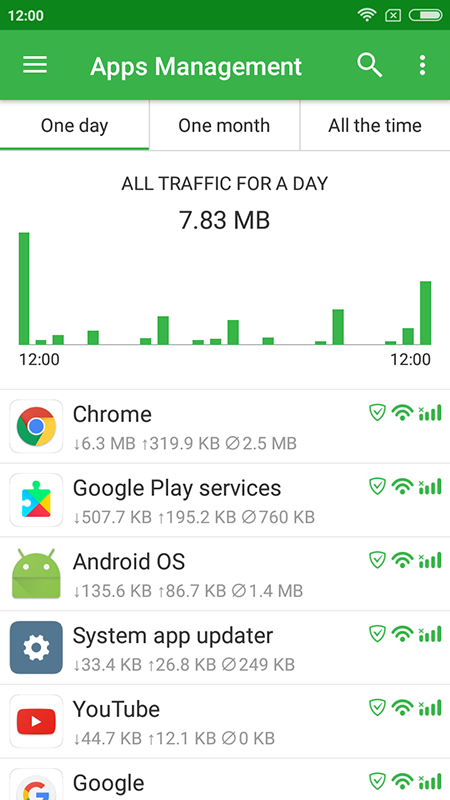 AdGuard for Android not only gives you an option of DNS filtering, but also allows to use any DNS server over the default one provided by your ISP or mobile network carrier. There are dozens and dozens of various DNS servers to choose from, encrypted and not, each one of them with its own advantages. As we already know, DNS servers can be used as an ad blocking and malware protection tool, but not only that — they can help you speed up your internet connection or set up a parental control. You can even configure AdGuard to use your own DNS server if you don't rely on any of the listed ones. And one more thing about privacy. Using a proxy server is not just about bypassing access restriction to geolocked resources. It's about security! If you are using a proxy server, intruders won't know what websites you visit. 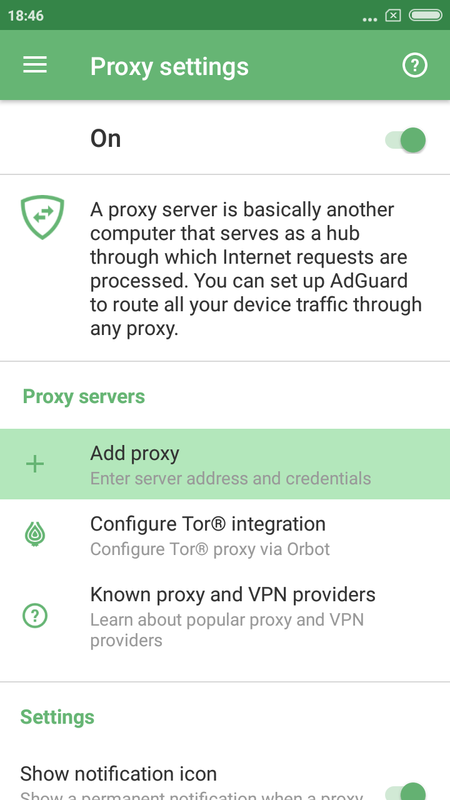 And by the way, AdGuard allows configuring a proxy right in the app. You can also use AdGuard along with the anonymity network Tor (we have already integrated AdGuard with Tor for your convenience!). If you need an instruction on how to set up proxy, look it up here. Also, you can configure your own proxy. Well, there are some options you can try! You can become our beta-tester and discover release updates. Here is the instruction on how to become one. You can file bug reports or feature requests to our open bug tracker on Github. Check out our public Telegram group where you can discuss AdGuard with developers in real time. Privacy protection is basically what we do, so I never get tired of stories about how unpredictable the ways of getting Facebook user data are. Cambridge Analytica might be dead, but the business of stealing users’ data lives on, and this article demonstrates one more example of that.